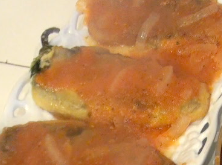 Click on the link to view my newest video recipe for delicious Chiles Rellenos. It is said that actions speak louder than words, but in my case inaction has spoken even louder. For the last four months I have neglected this incredible blog due to a lack of spirit, for it was drained from me when I endured the loss of my mother. But a little bit like a boxer who has momentarily had the wind knocked out of her, I am back. Gradually, I have regained my spirit and with it, the energy and desire to start blogging once more, and I so appreciate the patience of all of you, my incredible readers and subscribers. I truly am excited because I am filled with ideas for many delicious recipes for you. 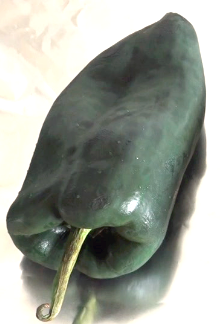 I start here, with Chiles Rellenos, one of my all time favorite Mexican recipes. Chiles Rellenos are Pasilla (also known as Poblano) chili peppers, which can be stuffed with either cheese or ground beef or as in this recipe, vegan shredded cheese. Broil chili peppers for 7 minutes or until skin is blackened, turn over and broil on opposite side for seven more minutes. Allow the peppers to cool a bit and then gently remove the skin. You will notice a small slit (if there isn’t one, then make one), remove the seeds and any excess skin under gently running water and set aside, (using gloves is optional). Take about 1/4 cup shredded vegan cheese or regular cheese and stuff each pepper, then secure the pepper with a long toothpick to keep the stuffing from falling out during the frying process. Beat the egg whites with an electric mixer until peaks form. Add the yolks into the egg whites and mix thoroughly with mixer. Spread the flour on a plate, then lightly and evenly coat each pepper with flour. Heat 3 tablespoons of canola oil over medium heat, dip a stuffed chili pepper into the egg batter and place in the pan with the hot oil, fry two peppers at a time, allowing the edges to turn golden brown before gently turning the peppers over. When each pepper is evenly golden all over, remove to drain on paper towels, and pat the peppers with additional paper towel to absorb excess oil. Place the peppers on a nice serving plate, and REMOVE toothpicks. Place water, tomatoes, quarter onion, garlic cloves and the optional chili pepper in a blender, and liquefy thoroughly. Heat the tablespoon of canola oil on high heat, then add the additional sliced onion and mix constantly until it begins to turn golden. Add the sauce from the blender, bring it to a boil and allow it to boil for three minutes. Add the oregano, salt and pepper, mix in and allow to boil 2 more minutes. Sauce is ready. With a large spoon bathe each chili pepper with the sauce. Serve hot, accompany with sliced avocado or a full meal and enjoy!